Hi everyone, im a new member since yesturday and forgot to make an intro but anyway i met some nice people which are admins and mods and i would like to thank Luna and Leah for showing me the ropes on this site and welcoming me. I'm a roleplay noob but willing to learn and get along with everyone here and i enjoy the acad here soo far, don't hesitate to get to know more about me and i won't hesitate to do the same for you guys. Greetings, and Welcome to the Gateway! 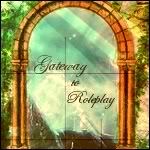 Feel free to take a look around and if you need some links to our currently active role-plays, just let us know and we can send you some links. ;) If you have any questions, just ask a staff member and we'll be happy to help! Welcome to the Gateway! Booze and dancing girls are in the back on the right, Chippendales to the left. We hope you like it here and post lots! Don't worry about your level, we're all willing to pitch in and work with you, so don't feel intimidated. Hello! Sorry I have been sooo busy the last couple of days. =) *hands over caramel brownies* I hope you have fun and post lots.